2013-2014 has been a busy year for the English department: 10 graduates, 8 Broadsides, 7 Pinchpenny books, 6 State awards for Red Cents, and 5 guest writers. Check out these numbers and more in our latest newsletter. 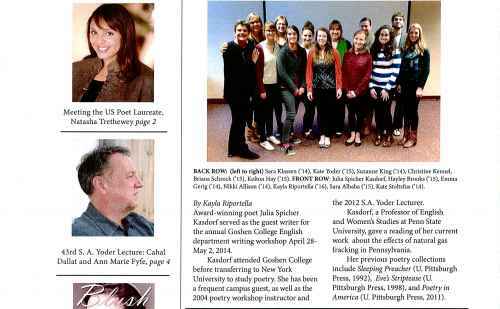 Award-winning poet Julia Spicher Kasdorf offered a poetry reading in the college's Koinonia Room on Wednesday, April 30. Irish-born and London-based husband and wife poets Cahal Dallat and Anne-Marie Fyfe will present Goshen College’s annual S.A. Yoder Lecture on Tuesday, April 1. Goshen College’s Pinchpenny Press released seven books in spring 2014 – three collections of student work and four authored by individual students. Awards, senior events, publishing, faculty updates, alumni news and much more in the new Spring 2013 Newsletter. The English Department releases a review of the 2012-13 school year so far. Exciting scholarships, internships, and student writings are included inside. Over Martin Luther King Jr. weekend, Johnson visited the GC campus. While here, she led a fiction writing workshop for students, gave a fiction reading, and presented in the MLK day convocation. 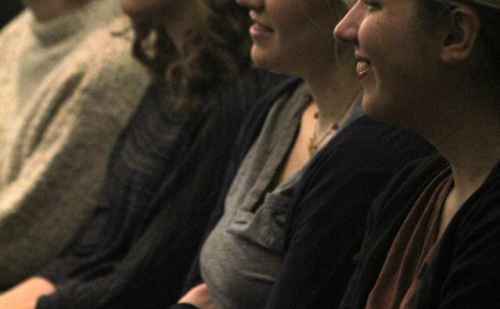 Is The Word, the student-led poetry slam, continues to flourish. 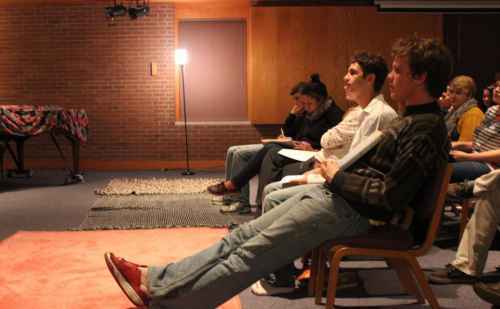 Students have created an on-campus venue to share, perform, and celebrate poetry. 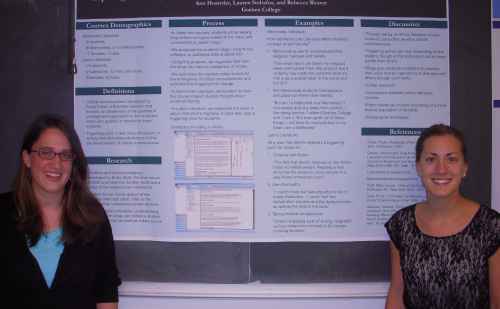 Read about one student's Maple Scholars experience with Latino and Mennonite literature.